Newly released on Kickstarter, the SITU is a food scale with a built-in Bluetooth chip that enables it to communicate with an iPad. 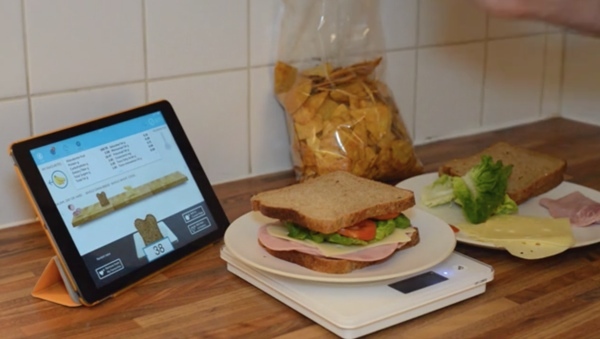 When a food item, such as fruits, vegetables, or even chips, is placed on the scale, it weighs the food and then relays the nutritional information to the iPad via the SITU companion app. Designed to allow people to monitor their calorie intake and other nutritional factors while preparing fresh foods, the SITU can measure each component of a meal to calculate its exact nutritional value. It's able to measure individual components and more complete meals, like a sandwich, a bowl of cereal or a slice of pizza. Place your food on SITU and you'll see exactly what's in it–from calories to salt to sugars to vitamins and minerals. You can use SITU to quickly check the nutrition content for a single piece of food, or you can choose to go further, tracking entire meals, saving them to your dietary history, setting alerts for nutrient limits, and even exporting your data to share with your doctor, nutritionist, or personal trainer. According to the product's developers, the SITU is a useful tool for calorie counters, athletes, parents, health professionals, and those who want to be more health conscious, tracking nutrients like sugars and salts within food. Additional details about the SITU and multiple videos of the product in use can be found on the Kickstarter page. Interested backers can preorder the SITU for a pledge of £50 plus £12 for shipping outside of the U.K., which equates to approximately $103. There are a limited number of scales available at that price and orders are expected to ship in November of 2014.